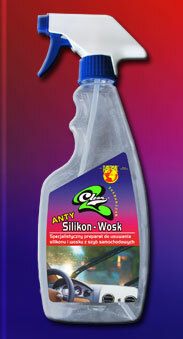 Silicon and wax on the windshield makes it difficult for the driver to see while driving in rain or at night. The formula is designed for removing silicon and wax that were left on the outside windows after waxing of the car body during washing. It is also proves effective when removing steam containing silicon, that formed as the result of using spraying formula COCKPIT type, the inside part of the windshield. The formula also removes nicotine residue.